Publicity photo of Pavel Fesyuk, a service technician and American Ninja Warrior contestant. Fesyuk was driving his route when he saw a man on the side of the road who appeared to be choking. He pulled over, and the man motioned for Fesyuk to slap him on the back. When that didn’t work, he performed the Heimlich maneuver. Whatever was blocking the man’s throat was gone, and without exchanging names or a “thank you,” the two men departed. Fesyuk didn’t think much of the incident. He had been recording with a dashboard camera, and sent the footage to his boss, Town and Country Operation Manager Caleb Fabry, who sent the footage to various news outlets. What followed was an intense period in the media spotlight as news organizations from seemingly everywhere wanted to talk to him about his experience. But Fesyuk was nothing if not humble about the event, and was surprised that it received so much attention. “If you don’t have 30 seconds to help someone, then obviously your schedule is a little too tight,” Fesyuk said. 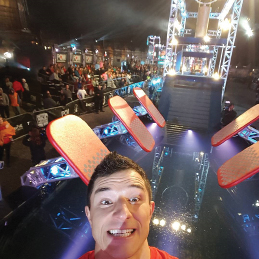 But it wasn’t Fesyuk’s first time on TV — he spent two years as a contestant on American Ninja Warrior (ANW), an athletic obstacle course-based TV show. After he wasn’t invited back for a third season, he began searching for other pursuits. Up next was mixed martial arts (MMA). Fabry recalled how Fesyuk’s support team — including friends, coworkers and family members — sat ringside to cheer him on at his first and only MMA match where “he pretty much demolished the other person in less than a minute,” he said. Once he arrived on the set in St. Louis, he realized the show is “totally different than what you expect — there’s a lot of show biz stuff.” In order to control the lighting and background, the producers record the show at night. “You’re up all night — 10 p.m. to sunrise,” he recalled. Fesyuk didn’t make it past the first round during season six, but he was more successful the next year (season seven) in Pittsburgh, where he was selected to move on to the national competition held in Las Vegas. He was eliminated in the national round, and since he didn’t come back for a third season, decided to move on to MMA fighting — another item on his bucket list.